From grand features like twenty-foot vaulted ceilings and spacious rooms to carefully-planned details like square glass doorknobs and vintage look light fixtures, every element inside the newest Board by Board Builders home seems like it belongs. In designing and building the 4298 square-foot, three-bedroom house, designer Christie Board said, the goal was to incorporate the most modern conveniences with a timeless setting. The result: “It feels every bit as good as it looks,” Christie said. And, although luxury abounds, comfort is really the most noticeable component. Because the residence sits on a 200 plus-acre horse ranch, Christie said, she and the homeowners wanted it to exhibit a sense of history, combining a vintage farm aesthetic with a curated feel. As the Boards and their clients selected pieces to fill the home, they strove to carry elements throughout the house. This sense of continuity is important in design, Christie said, because it allows each space to flow into the next. To that end, most of the light fixtures in the home have a vintage feel. The tumbled brick wall covering in the kitchen also provides a backdrop for the living room fireplace and the outdoor kitchen. In several rooms, including the master bedroom and the living room, the ceiling features exposed beams in dark wood. Both the deck and the living room feature windmill-style ceiling fans, and a soothing neutral color scheme flows through every space. In the guest bathroom, these include a barn-door-style shower door, an oversized vintage look tile surround, and articulated arm light fixtures. The powder bath has a vanity that appears to be a repurposed dresser and a vintage tray converted to a mirror. Both the guest and master bathrooms feature bold, dark grey-and-cream vintage-European-style tile, and in the master bathroom, Board used a real piece of furniture as linen storage. The ceiling light fixture in the master bedroom is a fan that appears to be a candelabra chandelier. The electric candles actually flicker when they become warm. In the kitchen, the island was designed to look like a cabinet that could have been in a 1900s-era drug store. And the custom-made double entry door has a transom above it, allowing for light and beauty. Of course, aesthetics aren’t everything, and that’s why, in designing this home, the Boards paid careful attention to how it would work. Modern living is busy living, and that’s why the Boards built this home with plenty of details to maximize the efficient use of the space. In addition to generous cabinetry in the main part of the kitchen, there’s a tall, wide buffet cabinet on the wall that connects the kitchen to the dining room. It includes more storage space, wine refrigerators, and a beverage bar. There’s also a banquette between the kitchen and dining room. The solution: she covered the bench seats in fabric that complemented the kitchen’s décor, she added decorative cabinetry with glass doors with wood accent details on the back side to tie it in with the space and add additional storage, and she continued the kitchen countertop along the back of the banquette. Knowing she couldn’t make a quick trip into town to grab something from the store, the homeowner wanted to make sure she had sufficient pantry space. The laundry room provided the perfect place to add it. The pantry runs one whole length of the laundry room, and features barn doors with a chalkboard finish—which the homeowners can use for keeping lists, or keeping their grandchildren entertained. It adds a nice contrast with the other white cabinets in this room and again feels like a furniture piece had been added. Throughout the home, light, wide-plank oak flooring with an oiled finish provides a durable surface with a vintage aesthetic. 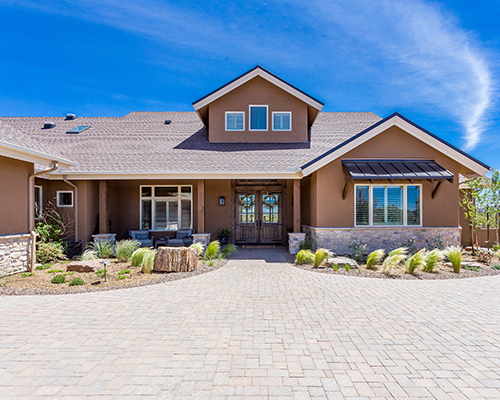 On the outside, the homeowners opted for a brown stucco exterior, which will stand up to the elements, and the Boards added metal awnings and French Country Villa stone in Champagne to create a rustic appearance.